Ballet and baseball seasons coincide, and deep into both seasons, key players are suffering wear and tear, and that has a ripple effect on their colleagues and fans. Namely, the Davids have been waylaid—Hallberg (ABT, foot) and Wright (Mets, shoulder). I got a hefty, overdue dose of Hallberg in recent weeks, seeing him in Cinderella and then twice in Giselle, the second time when he substituted for an ill Herman Cornejo. Then Hallberg succumbed to an injury last Saturday—perhaps from overwork?—and Cory Stearns stepped in for a performance of Swan Lake. Stearns again replaced Hallberg last night in Frederick Ashton's The Dream (1964) in a double bill of Shakespeare. It was a good opportunity to see him dance, and one I wouldn't have had otherwise. The best news of last night, however, was that Cornejo had recuperated and danced Puck in The Dream, among his finest roles, and one which he originated with ABT in this production in 2002. It fully displays all of his strengths—his utter naturalness (complemented by his woodland creature costume) in a highly unnatural art form, suspended leaps, a lovely musicality both precise and organic, and dashing wit. And while he is among the most romantic and sensitive of dancers, and is now in the regular rotation in white-tights roles, he remains legend in such spritely characters. His compact body type is of course not a first in ballet's principal ranks, though it is still the exception. It serves as a fine example for newly-appointed soloist Joseph Gorak, who on this program reprised the romantic duet with Sarah Lane in The Tempest, by Alexei Ratmansky, to music by Sibelius. Marcelo Gomes and Daniil Simkin portrayed Prospero and Ariel, and James Whiteside the beast Caliban (with a fright wig and patchy fur); Cornejo debuted that role last year, although I can't say it entirely rewards such accomplished dancers. Gorak has also been cropping up with regularity in lead roles including in Ashton's Cinderella and Ratmansky's Nutcracker. As previously noted, he recalls Hallberg in his innate nobility and épaulement, elegant line, superbly arched feet, flexibility, and composure. And since there are several gifted smaller women in ABT, he should be busy. Seeing The Tempest in its sophomore season and transferred to the Met from the Koch, it still reads as overly prop-heavy, which forces the staging into a flat, narrow horizontal area, and it is visually over-busy. Gomes is given solid geometric movements to underscore Prospero's gravity. Ariel is an ideal role for Simkin, freeing him to flit and spin, and fly in one of his signature moves, a low arabesque sauté in which the torso is kept perpendicular. (He is another principal who distinguishes himself best in solo character roles.) As Prospero's daughter, Lane is convincingly girlish and devoted. The corps comprises the ocean, most effective when spilling downstage in a crashing wave, although Santo Loquasto's overly embellished costumes distract. Back to The Dream, which is such a prime casting vehicle. Gillian Murphy danced Titania with a proper mix of fortitude and flourish, and her auburn ringlets somehow reinforce the fairy tale setting. Stearns seemed more at ease as Oberon than ever, again, finding the right balance of petulant and regal, and properly savoring the moments of technical braggadocio. Blaine Hoven was Bottom, and while he needs to hone his pointe shoe work, he captured the charm and innocence of his furry, long-eared avatar. The star-struck lovers were Adrienne Schulte, so comically expressive; the plastic-faced Grant De Long, Stella Abrera, convincingly puzzled at being spurned, and Jared Matthews, who once more showed his acting chops, which we will miss as he departs to Houston Ballet with Yuriko Kajiya. 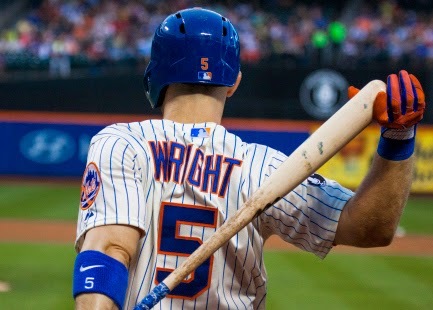 Heal, shoulder of David Wright. And as for the other David, over at the Mets (and not the Met)... fortunately, it's just a bruised rotator cuff on his non-throwing left shoulder. He should be back in the line-up this weekend, which is fortunate, as the Mets need him, his bat, his shoulder, and his rally towel. • Frank Cashen, Mets GM during the team's late 1980's golden era, passed away recently. He put together the 1986 world championship team which, in retrospect, was miraculous. Mex, the Kid, Doc, Nails, Strawbs, Mookie, Backman, Knight, Darling... while their fates have mixed to say the least, at least we have the privilege of hearing commentary by Keith and Ronnie, even as they twist in the wind as they cover the lackluster current team.